There’s no denying it: Spiders are the worst. With their eight, spindly legs, quick approach, and sudden appearances, they can sometimes be quite terrifying. They can often lurk in unknown places, completely unbeknownst to you. Some can be venomous, but they are all frightening. Luckily, the United States doesn’t have too many deadly spiders. Australia wins in that category, which is home to some of the most deadly creatures on the planet. But the ones we do have, are extremely common in San Tan Valley, Arizona. The most deadly spider in North America is the Black Widow. Known for its bright red hourglass located on the thorax, the Black Widow’s venom is fifteen times stronger than that of the rattlesnake. Considering their size and ability to hide in places we least expect, this makes them one of the most dangerous predators in North America. Their bites do not often result in death, but the flu-like symptoms often last from up to eight hours to upwards of three days. Its venom is extremely fast acting and can be extraordinarily painful. The presence of anti-venom does decrease the effects a tremendous amount, but they can still be somewhat harmful. Black widows can be found in trash, dark, dry shelters, basements, vegetation and many other places that we would not think to look. Luckily, there are several ways to prevent these spiders from lurking in and around your home. For instance, if a web has been spun- especially inside- it is advisable to clean it out with a broom or a dust rag. This will make the spider spins their web elsewhere in order to find a better hunting ground. This is a good way to keep these terrifying monsters out of your house and outside where they belong. Knocking down their webs along with treating the baseboards and openings with a variety of bug repellents and sprays should be more than sufficient. If you find that results are lax and the spiders continue to return, consult a local expert. Another horrifyingly common spider in the North American region is the Brown Recluse. Though they are not as common in San Tan Valley, they still have a presence here. Equally terrifying and frightening to look at, the Brown Recluse has a more damaging bite than the Black Widow. While the Black Widow’s does not leave a scar, the Brown Recluse can damage your skin and leave a large, open wound that could take as long as eight weeks to heal completely. If either of these spiders are seen in or near your house, some would suggest that you burn it down completely and move away. Fortunately there are easier ways to eradicate these walking nightmares from your life. There are many different bug repellents that have worked and continue to work on spiders. Most pest control companies are adept at handling these creatures and keeping them from entering your home and scaring the living daylights out of you and your children. And they are arguable harmless when unprovoked, but sometimes you could unintentionally threaten them. If they are hiding in your clothes or your sheets, or even your shoes, they could view your normal activities as a threat and become violent. These eight legged monsters have no way of knowing that they are intruding. They think they have just found a new vacation home in which to feast and reproduce, starting their new life. Little do they know that they are unwelcome and unwanted. Applying these repellents could be an option, but why not let the professionals at Varsity Termite and Pest Control help? We have the experience and knowledge you need in order to keep these vile, spindly-legged savages from taking up residence in your home. Trust our experts to eradicate the presence of spiders in and around your home so you are not alarmed by their mere existence. Our friendly professionals will locate their prime origin, treat the area in and around your house, and make sure that they do not make an unwarranted return. Your satisfaction with our spider extermination services will be guaranteed and you won’t need to worry about those pesky spiders for a long time to come. 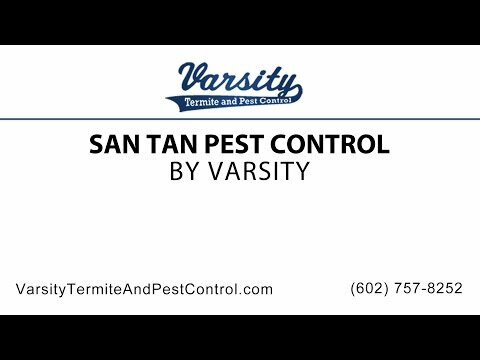 So for more information about our excellent spider removal services, contact the San Tan Valley pest control experts. Give us a call today at (602)-757-8252 to find out more.